WhyNotTheBest.org is a free resource for health care professionals interested in tracking performance on various measures of health care quality. 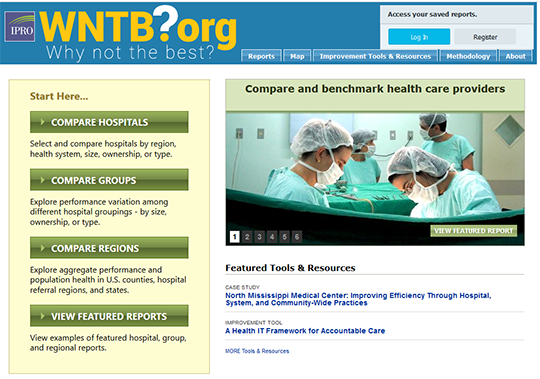 WhyNotTheBest.org includes process-of-care measures, patient satisfaction measures, readmission rates, mortality rates, and average reimbursement rates (from CMS Hospital Compare), and include data from nearly all U.S. hospitals. It also includes data on the incidence of central line-associated bloodstream infections, from over 1,500 hospitals across the nation. It also includes measures assessing whether and to what extend hospitals have adopted electronic medical records (from the American Hospital Association survey), as well as measures of population health and utilization and costs, from the Institute of Medicine. Finally, the site includes performance data for a subset of the Agency for Healthcare Research and Quality Inpatient Quality Indicators (IQIs), Patient Safety Indicators (PSIs), and Prevention Quality Indicators (PQIs) for the majority of hospitals in 12 states.